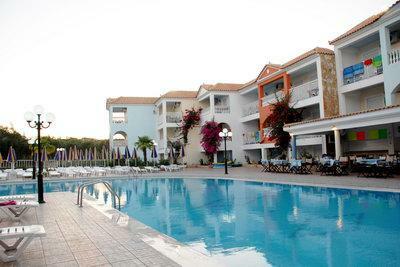 Planos Bay Hotel Free Child Places Tsilivi Zante | @Web2travelDeals. The 5 star Aqua Bay on the other side of the waterpark is independent, so you can book an All Inclusive stay at the Aqua Bay with 7 nts All Inclusive including flights from £763 p.p. Planos Bay Hotel facilities include an outdoor swimming pool, childrens pool, sun-terrace with loungers, umbrellas and a poolside snack bar. There is also a childrens playground, mini-football pitch, pool tables, darts, pinball machine, table tennis, a lobby bar, satellite TV room, outdoor entertainment stage and a large soundproofed entertainment lounge. A buffet style restaurant can be found at neighbouring Admiral Hotel. Guest services include 24hr reception, currency exchange, mini-market, laundry service, doctor on call and parking. Spread over 3 floors, all 110 apartments are provided with ensuite bath/shower room, hairdryer, ceiling fans, air-conditioning (local charge), safe deposit box (local charge), telephone, satellite TV, balcony or terrace and a kitchenette with fridge. Both hotels have their own bar, restaurant and pools. Bedrooms are all bright and airy, with a choice of 1 bedroom family apartment or 2 bedroom apartment. And as for the beach, it’s less than 10 minutes’ walk away. The waterpark here lies between the Planos Bay and Aqua Bay hotels. Family-friendly play zones include the fountain-filled Aztec Jungle and a pirate ship with slides. There are also mini slides for kids over the age of 5. Elsewhere, you’ll find high-speed slides like the Green Boomerang and the Bowl. Riders must be over 12 years or 140cm to zoom down these. As the Planos Bay is currently contracted to Tui group, you will generally not be able to book this hotel independently.